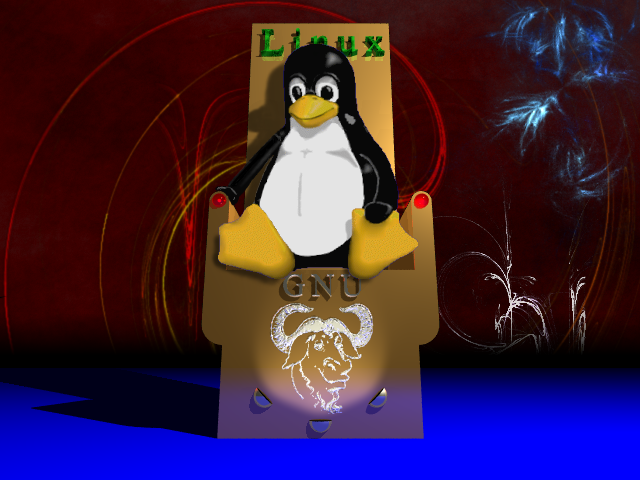 Linux penguin on top throne! Once upon a time (in 1998) I was taking a little stroll and felt myself to be in the mood of (trying to) making some nice picture. Slowly an image started forming in my head and suddenly I realized that somewhere, maybe not in this galaxy, maybe not even on this plane of existance, but somewhere there must be a penguin sitting on a golden throne as ruler. I got home and started forming the image into the computer. As you might have expected, I made the throne and texts with POV-Ray and then added the penguin and background with The GIMP. Well, it's perhaps not perfect, but it's the best I could do at the time. And all three totally free. GNU - Gnu's Not Unix!